Change in the annual mean of noon-time clear-sky erythemally-weighted UV, 1960-2100, relative to the level in 1980. 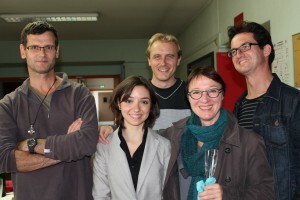 L. O. Björn, S. Madronich, R. L. McKenzie, A. F. Bais, P. J. Aucamp (M. Ilyas was absent, shown right). The photo was taken at the UNEP meeting in Zhengzhou China in August 2014 while working on the 2014 Assessment for which A. Bais will be the lead author. Photochem. Photobiol. Sci., 2011, 10, 182-198. Registration is still open for the 16th International Congress on Photobiology, to be held in Cordoba, Argentina, 7-12 September 2014. The meeting starts with two talks and a reception on the evening of Sunday 7th and ends on the afternoon of Friday 12th. There are optional excursions on Wednesday afternoon and a special Darwin-steps trip is being organized to take place immediately after the Congress.